Would you take a new potent drug because it’s popular and everyone’s talking about it? Of course not! When stated like that, it seems absurd. However, this is what the majority of retirees do with their investments when they invest. They blindly read a magazine article, listen to a call-in talk show, or meet with an investment salesperson and become mesmerized by the latest and greatest “Can’t Lose” investment doohickey without first knowing the rate of return they MUST earn from their investments. Don’t get lazy and fall into this trap. Do whatever is necessary to discover the investment rate of return you MUST earn first so you have a target! How Do You Find The Rate YOU Must Earn? Your Level of Retirement Bucket™ Dependence: how much money you need to withdraw from your Retirement Bucket™ each year to supplement your social security, pensions, and rental property income (if you own rental property), so you can live exactly the way you want. Inflation: This is the biggest factor as you’ll see in a moment. 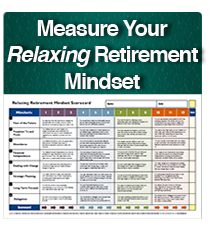 The good news for you is that I’ve outlined how you can determine your level of dependence using steps one and two of The Relaxing Retirement Formula™ over the last few weeks. Have you determined YOUR level of Retirement Bucket™ dependence? If not, I can’t urge you enough to take these initial steps if you want to confidently spend what you’ve taken your entire life to accumulate without fear. Calculating the size of our Retirement Bucket™ comes down to you having accurate and up-to-date statements on all of your bank and investment accounts. Given that we’re in February, you should be able to put your hands on January 31, 2014 statements rather easily. That brings us to #3: inflation. As we discussed recently, when it comes to inflation, you have to make some assumptions as to what you believe the rate of inflation will be in the future. Without going into too much detail on that issue here, I strongly recommend that you assume a higher rate of inflation than the present to be conservative. The reason for this is simple. You have no control at all over the rate of inflation. If you assume a low rate of inflation, as we’ve experienced recently, and inflation ends up being high, you’re going to run out of money sooner than you planned. On the other hand, if you guess high, and inflation ends up lower than you planned for, you’re still in great shape! Getting back to Steps One and Two, once you know your level of Retirement Bucket™ dependence, i.e. the amount of money you need to withdraw from your investments each year to keep pace with inflation, and you know the amount of money you’ve accumulated in your Retirement Bucket™, the rate of return you “need” to earn is the rate that allows your money to remain intact year after year while allowing you to continue to spend what you want. The key point to understand is that the investment rate of return you need to earn, known as the “nominal” rate of return, is in direct relation to the rate of inflation you assume. The rate you must discover is the “real” rate of return you need to earn, i.e. after taking your assumed inflation rate into account. Can you see why you must know this? If you have a large Retirement Bucket™, and you only need to withdraw a little bit each year for your supplemental income needs (like Jim and Sandy Independent in our case study over the last few weeks), you probably don’t need to earn a very big rate of return. On the other hand, if you need to withdraw a lot of money each year from your Retirement Bucket™ (like Ron and Rose Reactionary), you may need to earn a much bigger rate of return. Either way, the key is knowing that rate for you. If you don’t, it’s the equivalent of a surgeon opening up your body before knowing if you even have a disease, or where it’s located. You may very well be investing more aggressively than you need to and subjecting yourself to far more volatility than you need to. And, at the same time, if you don’t know the rate you need, you may be investing too conservatively and run out of money because your money isn’t growing fast enough to keep up with your spending needs.